Looking for a magazine that speaks to the issues that matter most to you, a Presbyterian woman? If so, look to Horizons, the award-winning magazine devoted to the mission and purpose of Presbyterian Women. 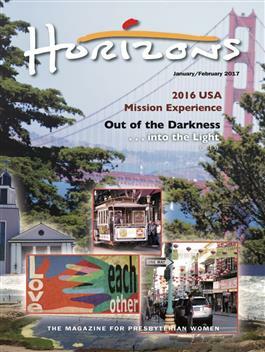 The theme of this issue is ""Mission/USA Mission Experience."" This issue also has Bible study resources for Lessons Seven and Eight of the Horizons study Who Is Jesus? ; the 2017 Birthday recipients and dedication service; the 2016 Horizons index; articles on immigration, human trafficking, and violence against women; and the usual departments that share how PW are fulfilling the Purpose of Presbyterian Women.